In the course of any further consultations with [Title] [First name] [Surname] we hope you will also encourage [select] in [select] efforts to return to, or start, work. Health professionals across the country will be horrified at this latest interference from the DWP – a move that undermines clinical expertise and threatens the safety of patients. There are a number of problems. First the letter places the expertise of DWP-funded ESA assessors above that of GPs. This is despite the fact GPs are more qualified to assess mental health, and can do so with the benefits of having known the patient for years, often decades (as opposed to in a one-off assessment). The DWP letter makes clear that they wish claimants to return to work at any cost, even if that means leaving a current occupation – an attack on the core identity of patients likely to have a damaging effect on mental health. Second, the letter states that “we know most people are better off in work”. This ignores a considerable literature showing that work can be damaging for mental health, with poor work environments a frequent trigger to mental breakdown. Economic evidence shows that rushing people back into work increases the likelihood of long-term illness. How then can it be right to encourage GPs to coerce patients back to work, a pressure likely to increase the feelings of shame, despair and anxiety at not working that have been exacerbated by the governments relentless and damaging campaign to associate worklessness with worthlessness? Third, the pressure the DWP is exerting on GPs to ‘encourage’ patients back to work, and desist from providing fit notes, is an attack on clinical expertise and the sanctity of the clinical space and clinical decision-making. Without a firm denouncement of this letter from Royal College of General Practitioners, we risk a situation where claimants will feel unwilling to make appointments with their GPs, given the level of fear the DWP and the work agenda elicits, with damaging and potentially life-threatening effects on the physical and mental health of claimants. It is vital that health professionals speak up for claimants rights, and insist that fit notes and therapeutic conversations are dictated by the needs of patients not the DWP. or being sent a summary of the Limited Capability for Work Assessment. 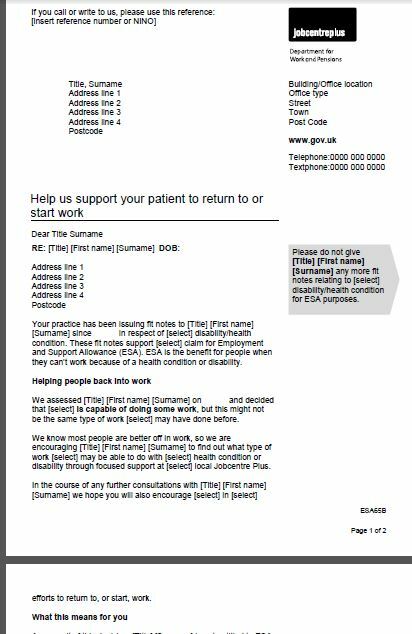 2) Because you cannot be sure that the ESA50 form will be read by DWP, you need to write to the benefit centre which processes your claim, to inform them that you refuse to give your consent to share the WCA outcome with your GP, or any doctor. You will find a proforma letter to do so at the end of this article. 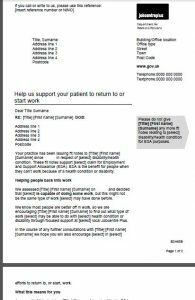 If you forgot to amend the ESA50 form in order to refuse your consent, you can still write to the DWP/benefit centre after every ESA50 form submitted and or after every WCA undertaken asking them not to share your WCA outcome with your GP. That should stop the DWP interfering in the doctor/patient’s relationship and destroying the trust which exists between them and also stop the DWP from exerting pressures on GPs in a way which can be detrimental for their patients. I am asserting my rights under the Data Protection Act (1998), as the Department requires my explicit consent to share said determination with my or any Doctor/GP, as it is my sensitive personal data. Please write to me to acknowledge receipt of this letter and confirm that my records have been updated on the appropriate IT systems. If I change my mind in the future I will write to the Department to advise it. I will not notify the Department of any change via the ESA50 form and should there be any doubt this letter should always take precedent. Atos refused to release my data stating I have to fill in a form which they send to the dwp to get permission?? As a private company my understanding is that any data they hold on me should by law be released to me under the data protection act ?? i believe the doctors are being forced to do what the government tell them to do against the patients wishes….heres an example as im hearing from a lot of pip claimants about doctors not putting their diagnosis down on their records so when it comes to gathering info for the dwp around about assessment time the proof isnt there….i have fibromyalga and im on 3 Gabepentins a day to treat this nerve condition that controls my life(my doctors surgery writes my prescriptions monthly yet they refuse to put my diagnosis down on the system)…..ive spooken to many others out there that are experiencing the same from their doctor practices….its deeply worrying as without the diagnosis on your records you dont stand a chance with claiming pip for your conditions…many genuine sufferers of fibromyalga are being treated the same as me by their doctors up and down the country…..surely its illegal to put patients on meds to treat their conditions and not put the diagnosis on their records as to why they are on these meds? I didn’t realise that it was so widespread. Many of my conditions are not in my medical records despite the fact that the GP diagnosed them. A major one being depression, because my (old) GP was like a friend & had known me for over a decade he didn’t want to put it down as anything stronger than “low mood” because of the potential consequences if a new employer or suchlike wanted a medical background check. I understand why he did it but as he was forced out of the profession thanks to the ridiculous NHS changes the new GPs, who have zero existing relationships with me, now look at my records & can’t find any of the conditions I have, only ones that have been verified by recent external reports. For example, I recently had a blood test that showed a huge elevation of damage indicators but my files didn’t have a major warning on them that I’ve had liver disease for over a decade. The reason being that people associated it with alcoholic issues & my former GP didn’t want me to linked with that, especially as I don’t drink! I’m dreading my future ESA because he isn’t there to write a letter with my full health issues on it. I’m so glad that I jdecided to check my emails, and came across this, as I am just getting my ESA50 ready to print out and send to the DWP – at least this is one way of keeping our consent ours! ive already filled my ESA50 form in weeks ago and am due for a WCA in 2 weeks, can i still use the template letter? I’ve submitted a FOI requst to try and ascertain whether a GP can still issue a Fitnote post ESA65B even if the coindition has not deteriorated. there is no condition and no appeal is yet in place – and also if the DWP will take responsibilty if the GP does not issue a Fitnote and the patient subsequently suffers. Many will remember my challenge against this and the other forced declarations on the ESA50, ultimately what the DWP do is to ‘unlawfully’ state that the claimant has not completed an ESA50 and automatically declare them as not of limited capability for work. I say unlawfully, as only declaration 1,2 & 3 on page 22 are legally required to claim the benefit. They left me without income for 2 years, then faked the evidence before tribunal. (A tribunal they had relisted as a lesser point in law,just minutes before it took place). The tribunal had been listed to address the aforementioned declarations and other associated points in law, instead they had it relisted for time out on the ESA50’s and faked the communication dates. The judge even went as far as to block the evidence of a time and dated Email from a JCP manager, which proved they faked the dates. The HM Courts & Tribunals Service then blocked any investigation in to this wrong doing. The actual points in law the Tribunal should have been looking at. 1. The Data Protection Act 1998, and the associated issues of the Department of Work and Pensions allegedly wrongfully declaring ATOS Healthcare as a Data Processor, when prior rulings by the Information Commissioner would clearly define them as a Data Controller in the Capacity of conducting the WCA. 2. The Right of Supersession (Social Security Act 1998). In which the state has not been showing sufficient or obtaining for the purpose of, evidence to Supersede an existing award of benefit. No supersession has been applied, which is in contravention of Social Security Act 1998, on existing awards, by the department of work and pension. (Those subject to the migration process). 3. That Declarations 4, 5, 6 of the ESA50 questionnaire, are allegedly in contravention of Article 7(1) ‘forced submittal to retrospective laws’ and Article 8 ‘forced termination of right of privacy’ of the European Convention of Human Rights. As well as being enforced with no right of Refusal in sharing of Private Personal information with other Data Controllers in contravention of The Data Protection Act 1998 and that ATOS Healthcare has not been correctly declaring themselves as a Data Controller in respect of the WCA in direct contravention of The Data Protection Act 1998. Instead at the last minute they altered it to the lesser issue under Regulation 22 of the Transitional legislation. To put it simply that relates to them ‘timing out’ the ESA50 if not returned. I was not actually informed of this fully until the hearing had already started. (Another unlawful action). The judge and the DWP then lied about the dates in which they carried out the reasonable adjustments under the Equality Act 2010, as you can see on the attached screen grab of the email on that article. Their date is complete fiction. Yet the HM Courts & Tribunals Service blocked any investigation. So be prepared for their dirty tricks if you do redact any non required declarations. Free Railcard for unemployed people National ‘Oppose Driver Only Operation’ Rally Wednesday 25th April.